Picking up yet another toy and finding yellow squash in the play kitchen, the dialogue of frustration begins. I am done for the day. And yet I have laundry in the dryer that will need to be folded and mostly put away (I don’t dare try to put the kid’s clothes away while they sleep) while the clothes in the washer will need to go in the dryer. As I type, I also hear the hum and shuffle of our dishwasher. Those dishes will need to be put away too. A Mama’s work is never finished. But this Mama is tired. I wonder to myself if it would be different if I worked outside our home. Maybe then our children would be just as excited to see me as they are their Daddy when he returns home. Maybe then I would be appreciated for my work. Wouldn’t it be nice if for one day I could have a clean house? No mess to clean up at the end of the day. No toys to trip over as I straighten up the Living Room. After I put the kids to bed I could relax, read a book, start a craft project. 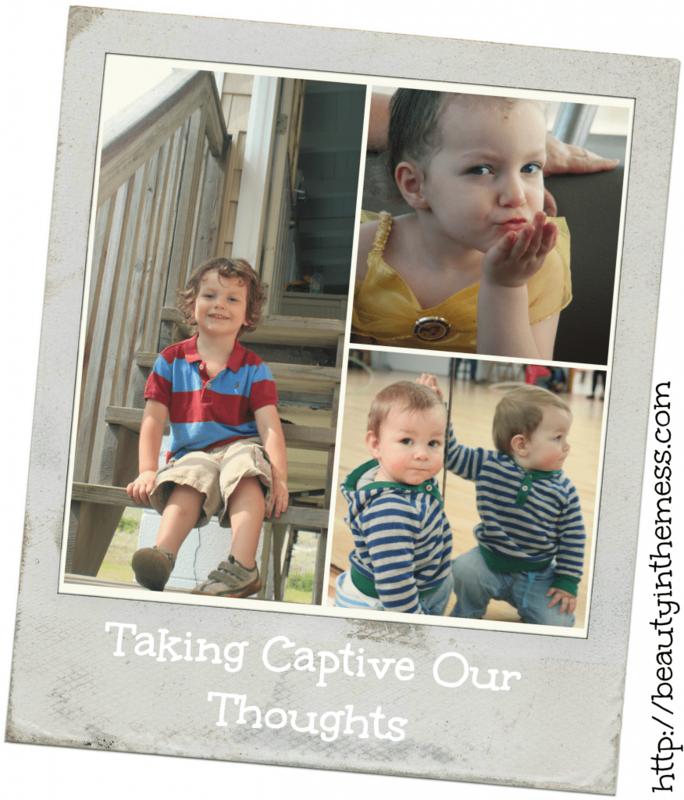 Just as quickly as those thoughts come to my mind, I take them captive to the Lord. Those thoughts are from the enemy. Those thoughts lead down a dangerous road of discontentment. 2 Corinthians 10:3-6 tells us, “For though we walk in the flesh, we are not waging war according to the flesh. For the weapons of our warfare are not of the flesh but have divine power to destroy strongholds. We destroy arguments and every lofty opinion raised against the knowledge of God, and take every thought captive to obey Christ, being ready to punish every disobedience, when your obedience is complete.” Those thoughts are me thinking that I know better than God. That His blessings in my life aren’t enough. Ouch! I had the clean house. I had the toyless Living Room. I did work outside the home. And do you know what I wanted more than anything during that time? Toys strewn across my house. Little handprints on my glass windows, doors, and stainless steel. And little voices calling me into their room for one more story. Tears. Lord, forgive me for thinking that your best is not enough and that I know better. I don’t want to go back to that other life. Show me how to enjoy these little blessings everyday. Change my selfish heart that I am be selfless. That I wouldn’t see my duties as a wife and mother as a burden, but as a blessing. May even the mundane daily activities be an act of worship to you. They aren’t little forever. The day will come that they won’t want me to read one more story or sing one more song. No longer will they ask me to come and blow bubbles with them or draw with chalk on the sidewalk or cuddle on the couch as we watch their favorite movie. One day they won’t slip their hand into mine as we walk down the sidewalk side by side. One day I will look back and miss this season of having little. Their innocence. Their love of life. So for now, I will cherish each moment. I will put down my phone. Why would I think that a status on Facebook or a picture on Instagram is more important than my children? Maybe I won’t be as quick to answer a question you ask or approve a comment, but I will be present with my family. Because they are most important. Do you struggle with thoughts like these? What ways do you stomp them out or do you? I’d love to hear your thoughts! I do struggle with these thoughts! So often! My first baby is just 7 months old. All I wanted to be was a SAHM, but it’s so much harder than I thought. I have to continually *try* to replace the lies with truth. Some days are better than others! 🙂 I’m visiting from Transformed Tuesdays! Thanks for stopping by! It is hard. But God is so good. Motherhood is definitely refining. Been one of those days–so I praise God for His timing–sharing your thought just when I needed to hear it. I, too, now stay home with my children after years of working outside the home. Today, was one of those days I needed this reminder. So thankful God has given me the opportunity to stay home and so today, I pray for those who can’t. I love having the opportunity to stay at home, but some days are just hard. I am so thankful that His mercies are new every morning! Thank you for sharing your experience. Sometimes it’s helpful to know that you aren’t alone :). Blessings! I am so glad you linked up your post at Transformed Tuesdays at moretobe.com. It is a perfect illustration of how God changed your heart as you submitted your thoughts to His truth! And by the way, you quoted one of my all time favorite verses! I am so glad I found the link-up! That was definitely a God thing. I love that verse too!! This is what I want my blog to me about. Thank you for stopping by! Great post, Whitney! 🙂 Touched my heart! I loved this and so important to remember!!! When I had to go back to work this year, I missed my time at home so very much, so on the days I was able to be at home I was so much more thankful for it. I am sure! As much as I sometimes long for adult interaction, I know being home is a blessing. I’ll take it as long as I can and savor even the hard days. Thanks for stopping by, Tleshia! I’ve been struggling with this a lot lately. Thank you for this post. Definitely cried my way through! Thanks for stopping by, Nannette! The days are long but the season is short. I can’t believe how quickly the last four years have flown by. I blinked and my daughter went from a baby to a four year old. I struggle with how messy my house gets and if my family appreciates what I do. I Gree it’s a source of discontent and also I think discouragement. I’ve been reading a great book and really grown in my journey to contentment and am for that I’m greatful! Great post thanks for sharing!